There are times when I can wait patiently finishing the outside of a dollhouse first and then doing the interior decorating. This is NOT one of those times. 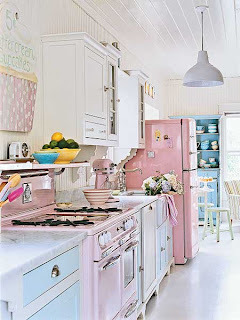 I nearly exploded with excitement over my little shabby chic interior! I blame Pinterest entirely! Not only do I get my ideas organized, but I also get to see everybody else's amazing internet finds!! This is my little cupcake made by using thick canvas(book binding). 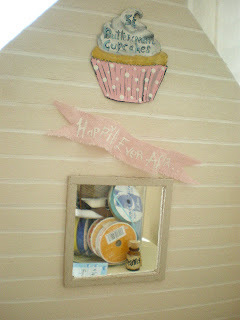 I also made a little pink banner that reads "Happily Ever After." 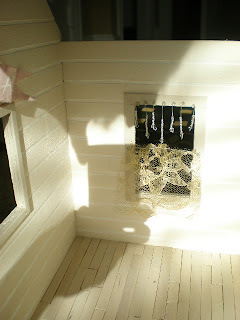 With a little tea stained piece of lace for the bottom curtain. 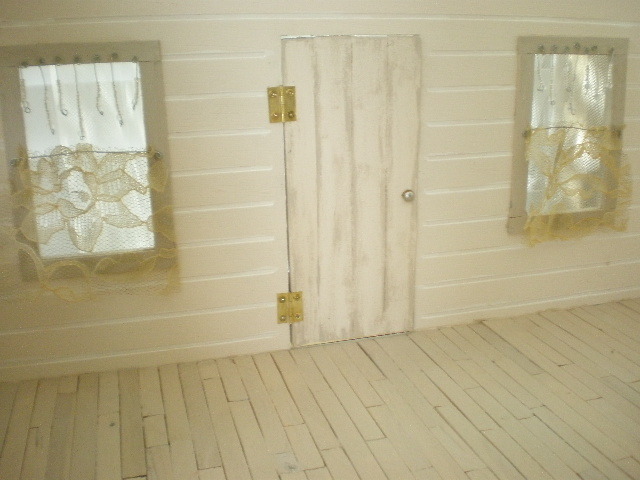 The door is also done and hinged. Here is the fireplace mantle. 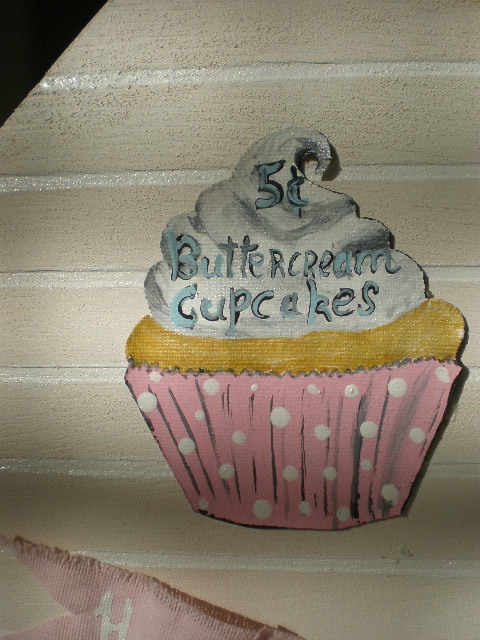 With a pennant banner, a hand painted sign, bouquet of fabric roses and a tiny bird house. The bird house is cardboard and it is on a pedestal made from a push pin. 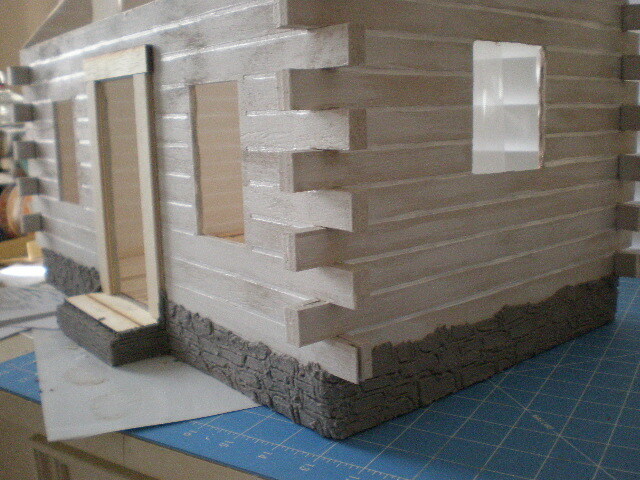 I put on the roof. I painted the ceiling a very faint pink. I just love the sweet glow this gives the room. 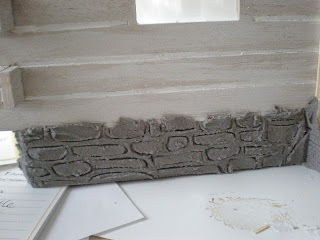 On the exterior, I made the stone bottom out of concrete. Oh my gosh...this is DARLING! I feel so redundant when I leave you comments but really, you just never cease to amaze!!! 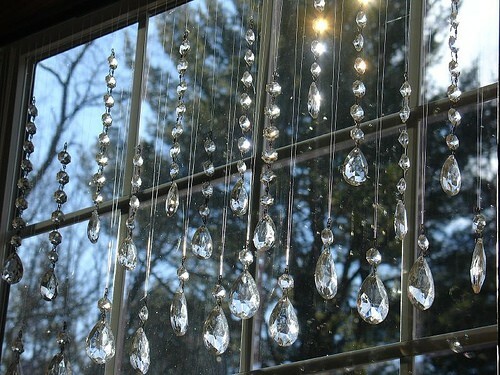 I adore the little crystal window covering! You're unbelievable, Caroline! What drives you, I don't know. But, I wish I had some of it. Firstly, I find that door with the hinges so striking! It caught my eye. Adorable, those little crystals in the window. That photo of the dream kitchen is very inspiring. The crystal curtain is so amazing! I would move into that house if I were a doll! 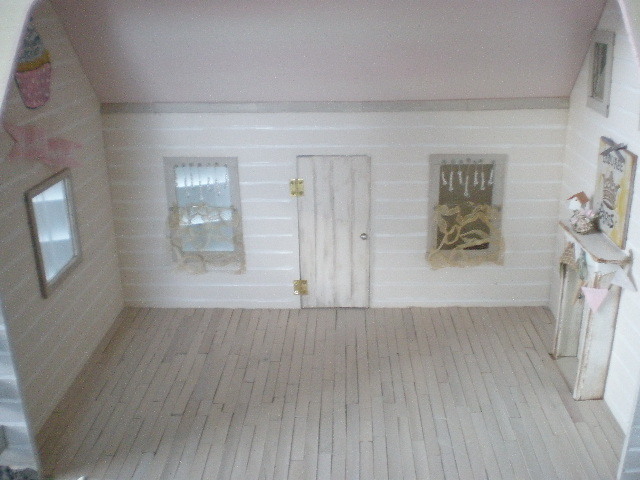 I wish I had a decent workspace so I could build dollhouses. I agree with Lucille - I want a bit of whatever you're on!! Maybe something would actually get done around here LOL It's so funny that you're blaming Pinterest for this burst of activity whereas most of us are blaming it for not much happening except Pinning!! ;) This little shabby project is soooo cute, especially love that bunting around the fireplace. and he even won first place with it and took it to the county competition. So we were thrilled. Un monton de ideas y a todas les sacas partido, me encanta como te esta quedando. Your little cabin is adorable, it looks so lovely with his bright colors ! 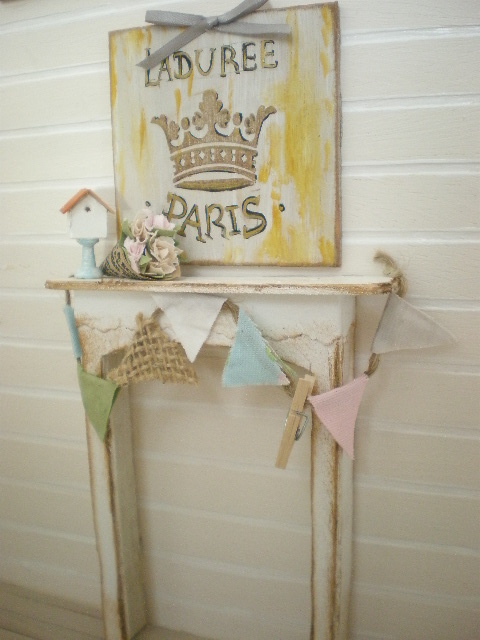 I like the little paris painting on the fireplace, did you paint it ?? Promete ser una casa espectacular!! Estaré super atenta, me encantan tus ideas y creatividad! !